Lloyd Thornburg’s MOD 70 trimaran Phaedo3 has capped a very busy season with a very special record. 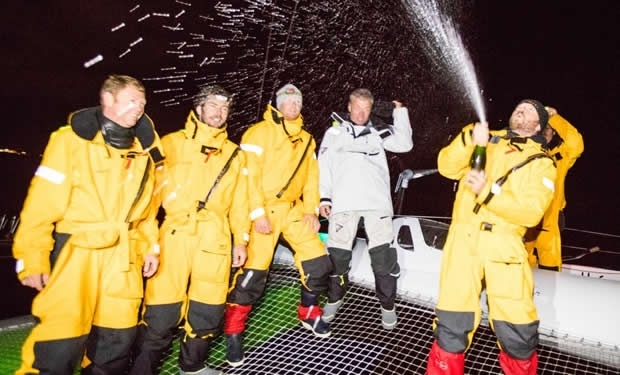 Thornburg and the crew of Phaedo³ have just completed the Rolex Fastnet Race course in approximately 27 hours and 34 minutes (pending ratification by the World Sailing Speed Record Council). Their times shaves approximately four hours off the old record set during the 2011 Rolex Fastnet Race by Loick Peyron and the crew of the 131ft trimaran Banque Populaire V (now Spindrift 2). In uncharacteristically light winds of this year’s Rolex Fastnet Race in wihch they finished second overall to Spindrift 2, Thornburg, co-skipper Brian Thompson and the rest of the crew felt they could do better. In fact they thought that in the right conditions, they might have a shot at breaking the course record. The 'right' conditions arrived yesterday, and the crew was able to wind Phaedo³ up to 30 knots almost as soon as she crossed the starting line off Cowes at 1.24am on Wednesday. They never looked back. After just crossing the finish line an elated Thornburg said: "We are really excited to have the Fastnet World record (yet to be ratified) , What an amazing sail, its not an easy course, its one of our favourites and we wanted to see if we could make it our own and thankfully we did…"